While many voters are keenly focused on the presidential race, a number of state and county offices will likewise be on the ballot in Hawai‘i. In anticipation of early voting, a forum was held at UH Hilo on Oct. 13, 2016, which featured a handful of both state legislature and county council candidates. On one wall of the room, there were large posters asking multiple questions for different topics. Students and others present were given four star stickers each, to put next to the questions in the categories that they would like asked; the ones with the most stars made the final cut. Each candidate was given two minutes to answer each question. The participants who arrived for the forum included Hawai‘i County Council candidates Moana Keli‘i (District 3) and Eileen O’Hara (District 4). Of the state legislative candidates, current District 1 Representative Mark Nakashima, a Democrat, sat alongside his competitor, Republican Byron Young. The Green Party candidate for House District 3, Kealoha Pisciotta, was also present, as was the incumbent for House District 4, Democrat Joy San Buenaventura. The most well-received question, as judged by those present, was concerning solutions for homelessness. Considering that Hawai‘i has the nation's second biggest homeless rate per capita, each candidate was asked if he/she would support a sit and lie ban, similar to the one currently enforced in Honolulu. O’Hara addresses that for her district there is no single solution and that the causes of homelessness need to be considered. She argued that most of the current government funding is mainly for permanent structures, and that funds need to be allocated for temporary housing since most homelessness is transitory. Keli‘i further stated that other causes of homelessness need to be observed such as mental illness, lack of employment, and substance abuse: “We talk about homelessness and we talk about affordable housing. What’s in between is the answer,” Keli‘i said. On this question, state House candidate Young said that “I know that the state has land. I know that they have money somewhere... There's no reason that we should have people on the street that don't want to be there. To build a house isn't that much.” Young’s opponent, Nakashima, entertained the solution of certain increases in property taxes. “You can hold it [land] for as long as you want... but there's no pressure on you to do anything with the land,” Nakashima said, after noticing an alarming amount of vacant houses in his district. "We need to create more pressures to find ways to bring houses into the market, and a property tax is one of them." All candidates did not give their support to sit-lie bans except for Eileen Ohara who claimed "it depends where and when." The next question with a given one-minute answer was about ‘clean’ elections. meaning transparency with campaign funding and if the candidates would support publicly-funded elections, also known as campaign finance reform. All of the candidates support the idea of public funding being entirely provided by the people, instead of usually self-seeking union and funding from business interests. Next, food security was discussed. The premise of the question related to the current Big Island population being close to what it was pre- colonial contact (around 200,000), yet today at least 2/3 of our food products are imported. “Agriculture gets not quite 1 percent of the state budget today, yet in the 1960s it got nearly 15%,” said co-moderator Donovan Shouse, so the following question was what ideas they had to support and revive local farming practices. Pisciotta seemed to have put most of her focus on bringing back native community fish ponds that fed everyone, with the key being access to clean water. She wishes to support farmers and fisherman. Young addresses the price of land being a major obstacle aspiring farmers are discouraged by, "if we can get land, people want to farm." He also suggested community farming to feed everyone. All agreed that local farming needed to be incentivized. The issue of trash is more concerned with the county, so the question was aimed to county candidates. “The Hilo landfill was set to expire years ago and now we are truly at the end of our limit, so only a couple more years before it’s reached its absolute maximum," said co-moderator Shannon Matson. Due to this alarming fact, it was asked how high on their list of priorities the landfill would be. Later, a surprise lightning round hit the candidates, who were expected to answer seven strictly yes-or-no questions. The first question was about preserving school meditation practices; all candidates were in favor. Next, a ban on single-use styrofoam, due to its inability to biodegrade: all said yes - except for Nakashima. Keli‘i was concerned with harming small businesses but otherwise agreed. All supported use of police body cameras. Byron voiced his concern for cameras being used against police officers - with potentially every action being micromanaged including private speech in their cars - but believes they should be used at every encounter. They were all again in unison with supporting GMO labeling of food; Nakashima, however, said no to a glyphosate ban. An additional question was asked regarding a highly debated ingredient in sunscreens, oxybenzone, for its ties to coral bleaching. All candidates were interested in exploring a ban, yet San Buenaventura voiced the issue with a ban being that it “can't really be federally stopped at the border,” but would support appropriate labeling and advertised warnings. To top off these questions, the candidates were asked if they supported the Thirty Meter Telescope (TMT), and after stirring in their seats, all said yes - except for Pisciotta. Upon introducing themselves, each candidate gave a small synopsis of their main focuses if elected and reasons for running. 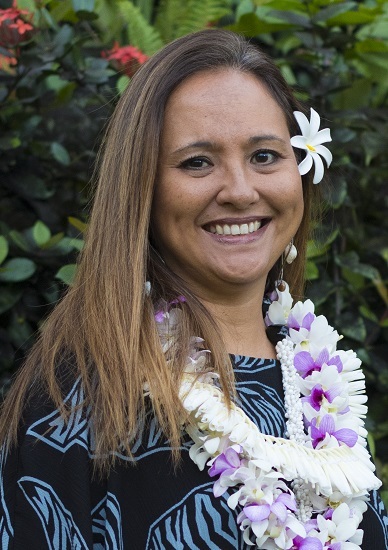 Keli‘i is motivated to run for office because as her daughters enter college on the mainland and she fears that they won't be able to return to Hawai‘i because "the cost of living is too high, issues with affordable housing, not being able to find jobs in their field of study. I want to be able to create a thriving community that is safe with a stable economy with resources to support their livelihood.” She is a union agent representing almost 4,000 members statewide and she works with advocacy and representation in protecting their rights. Eileen O’Hara has lived in lower Puna for 35 years. 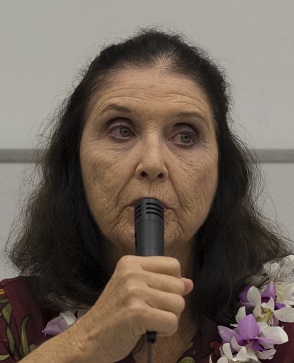 O’Hara is also an adjunct faculty member at UH Hilo. 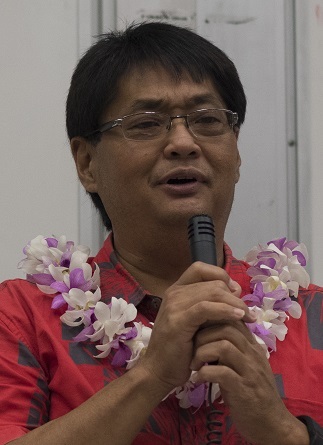 Nakashima’s Republican rival, Young, served in the U.S. Army after high school; later, he became a carpenter and currently works on houses along the Hāmākua Coast. For Young, the biggest issues are health care - specifically the cost of insurance - more sustainable agriculture, and legalizing marijuana. Pisciotta, District 3’s Green Party candidate, was inspired by Bernie Sanders’s campaign to change the paradigm in her own backyard. She was born into politics, and has family members in the Hawai‘i Nationalist Movement. Through work abroad, Pisciotta claims she has been given a more global perspective; she ultimately hopes her district will be a breadbasket of organic foods. For District 4, incumbent San Buenaventura is running for reelection because she does not think her job is done, considering representatives are elected to two-year terms. Ke Kalahea will update readers on the results of these and other races in a future issue.